It's not about competing with anybody. It's about becoming your personal best. There's enough space for everyone to shine. A beautiful young woman with the power to inspire a nation and make a difference. 20-years-old Maria Psilou was crowned as Star Hellas 2017 on Sunday July 16,2017. She represented Greece at the 66th Miss Universe pageant. In the same event Theodora Soukia was crowned as Miss Hellas 2017, to represent Greece at the 67th edition of the Miss World pageant in Sanya,China. Greece has produced one Miss Universe Corinna Tsopei, Miss Universe 1964 and one Miss World winner, Irene Skliva, Miss World 1996. Congratulations to Star Hellas and Miss Hellas 2017! The I AM ONE Organization is an agency network of innovators, creators and culture purveyors, working to build an investment portfolio of branding innovation. We act as value added investors, not simply managers, through new business development, strategic counsel and add-on acquisitions that will keep the I AM ONE Agency Network on the cutting edge of branding innovation, while finding new ways of thinking and doing. The I AM ONE Agency Network, investing in the next new brand experience for the connected world is ‘Open to Imagination’. The I AM Creative is a creative and production team comprised of passionate, talented people consisting of photographers, videographers, fashion models, fashion stylists, hair & make up artists, set designer, and film and art directors, whose work best portrays the beauty, fashion and entertainment industries. The Star Hellas, Miss Hellas, Miss Young title is a trademark for Vassilis Prevelakis and Associates E.E. George Prevelakis, the founder of the company, was the driving force behind the Hellenic Beauty Pageant since the late 1960s. George Prevelakis later founded a company (Vassilis Prevelakis and Associates E.E. ), together with his son, Vassilis, and transferred the rights to the pageant to the new company. Vassilis Prevelakis and Associates E.E. has been the legal owner of the pageant and is the national director of the well known international pageants such as Miss World, Miss Universe. Three winners are crowned in the contest: Star Hellas who goes on to represent Greece in Miss Universe, Miss Hellas who goes on to represent Greece in Miss World, and Miss Young who is chosen from contestants aged under 18 years. Star Hellas and Miss Hellas each have a runner up, who can also represent Greece in other major international pageants. Miss Universe is an annual international beauty pageant that is run by the Miss Universe Organization (MUO), an Endeavor company, and is held in more than 190 countries worldwide and seen by more than half a billion people annually. The Miss Universe Organization and the brand are currently owned by WME/IMG talent agency. The Miss Universe Organization, creates and advances opportunities for women around the world through its network of relationships across entertainment, fashion, beauty and philanthropy. It encourages every woman to challenge herself, find her unique voice, and embody the organization’s mission of being Confidently Beautiful. The 10,000 women who participate in Miss Universe programs annually inspire others to pursue their personal and professional goals while making an impact in their communities. The Star Hellas National Beauty Contest is the exclusive license holder of the Miss Universe contest in Greece, which means that the Star Hellas titleholder has the unique opportunity to compete in the Miss Universe final. The winner of Miss Universe® embarks on a year unlike anything else, receiving exciting prizes, cash and services, as well as: •	An employment contract with the Miss Universe® Organisation. •	Becoming a representative of the company for one year, travelling the world, meeting heads of state, dignitaries, participating in official charity and social events, appearing on television, speaking on a variety of topics, and getting the education, experiences and values to fulfil her career goals. For more information, and to learn more about The Miss Universe Organization’s official global causes, please visit: www.missuniverse.com. About IMG IMG is a global leader in sports, events, media and fashion, operating in more than 25 countries. The company represents and manages some of the world’s greatest sports figures and fashion icons; stages thousands of live events and branded entertainment experiences annually; and is the world’s largest independent producer and distributor of sports media. IMG also specializes in sports training; league development; and marketing, media and licensing for brands, sports organizations and collegiate institutions. In 2014, IMG was acquired by WME, the world’s leading entertainment agency, to form WME | IMG. The Miss World Organization owns and manages the annual Miss World Finals, a competition that has grown into one of the world's biggest. Miss World is the oldest running international beauty pageant. It was created in the United Kingdom by Eric Morley in 1951. Since his death in 2000, his wife, Julia, succeeded as chairwoman of the Miss World organisation. Along with Miss Universe, those pageants are the most coveted beauty titles when it comes to international pageant competitions. Miss World 2018 will be the 68th edition of the Miss World pageant. 120+ countries and territories are expected to join the oldest beauty pageant in the world. The dates and venue are yet to be announced but according to news reports the pageant will once again take place in Sanya, China. Manushi Chhillar, Miss World 2017 from India will crown her successor at the end of the pageant. The Miss Hellas National Beauty Contest is the exclusive license holder of the Miss World pageant in Greece, which means that the Miss Hellas titleholder has the unique opportunity to compete in the Miss World final. 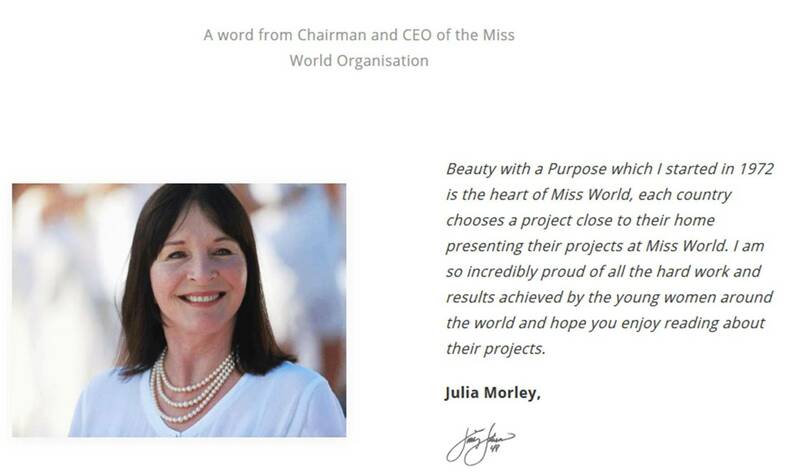 The Miss World Organization supports various charities across the globe via the Beauty with the Purpose project. The Miss World titleholder spends a year travelling to represent the Miss World Organization on a philanthropic journey through the respected Miss World program, Beauty with a Purpose. 'Beauty with a Purpose' is a non-profit organisation associated with Miss World that raises money and participates in humanitarian projects across the world. It operates on a global scale and awards the contestant with the most relevant and important charity project in her nation. During her reign, Miss World spends the year travelling around the world in support of worthy causes.